Gudi Padwa Shobha Yatra 2019: All About The Traditional Procession Organised on the Maharashtrian New Year, View Pics! The Maharashtrian New Year which begins with celebrating Gudi Padwa will be marked on April 6 this year. The festival of Gudi Padwa is the beginning of the Hindu Calendar month of Chaitra. It is the arrival of spring as well as the celebration of new beginnings. Maharashtrians hoist a traditional Gudi which is a mark of bringing good luck and positivity in one's home. Along with the Gudi, a larger celebration takes place in the form of Shobha Yatra. A Shobha Yatra refers to a traditional procession, which sees people coming together to mark new beginnings. Gudi Padwa Shobha Yatra 2019 will be from 8:00 am to 3:00 pm on Saturday. Gudi Padwa 2019: Learn How to Make Gudi At Home With This Simple DIY Video Tutorial to Celebrate Marathi New Year. Shobha Yatra of Girgaon in Mumbai is very famous which sees people coming from all parts of the city to participate in it. The Shobha Yatra begins early in the morning and is one of the ways of reliving traditions and culture. It begins at 8 am in the morning and goes on till the afternoon. Over the year, this Shobha Yatra has become a major attraction for people all over the city. An amalgamation of all cultural practices of the Maharashtrian community is seen here. 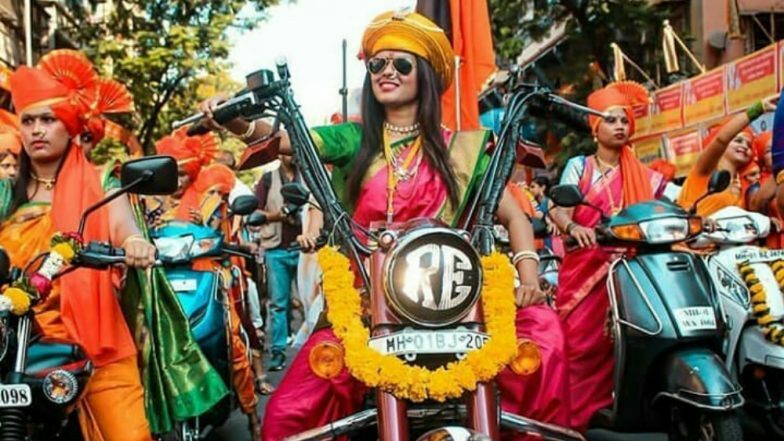 Gudi Padwa 2019: 2 Ways to Wear Traditional Maharashtrian Nauvari (9 Yard) Saree or Kasta. People practise for days together to be a part of Shobha Yatra. The procession showcases different groups of floats, which create awareness about different social issues. Women dress in traditional attire, with their best jewellery and take part in the procession. There are special bike rallies also held on this day, all a part of the bigger celebration. Even women are seen riding bikes, draped in nauvari sarees and making their mark in this celebration. Traditional Dhol Tasha is played and lezim dance is performed. Every Shobha Yatra sees an enthusiastic vibe of not only the participants but also those who come to see it. This procession is a way of coming together, celebrating the culture and wishing each other for a prosperous year ahead. Have you attended any Shobha Yatra before? If not, be a part of one and experience the festive vibe of bringing in the new year. Wish you all a very Happy Gudi Padwa 2019!